To Update formZ 8.5.0. 8.5.0.1, or 8.5.0.2, just use the formZ Help Menu: Check for Update command to automatically update your software. NOTE: Please contact us at support@formz.com or start a new forum thread if you have any feedback or issues. When the UP Box was first announced our CEO Michael Tyson knew we had a 3D Printing Solution using formZ one that would utilise the larger build area of this new 3D Printer and to take advantage of the 3D design power of formZ. The first thing that came to mind was a 3D Printed Guitar! The body was designed and printed in four parts on the new UP Box 3D Printer using a unique PLA filament called PolyMax PLA, due to its high strength and resistance to warping. The project was successful due to the combination 3D Design skills by Michael Tyson and some helpful advice from myself. This guitar is a hybrid of the latest 3D Printing Technologies with traditional Guitar Luthier techniques, utilizing a maple neck and mahogany block fitted in the body to provide traditional tonal qualities. To create the 3D Design we used FormZ 3D Design Software and if you want to modify the design this is the design software to use. We find FormZ really easy to use and it exports to perfect stl files ready for your 3D Printer. By using FormZ and 3D Printing we were able to add designs to the body which would be difficult with conventional wood working techniques. The playing card suite design is a good example of this. In addition we have designed the guitar so you can easily change to different 3D Printed Bodies in under 45 minutes. You will never get tired of your guitar. Having personally made a 1959 Gibson Les Paul replica from scratch we have found printing the shell of the body out of PLA with a Queensland Mahogany block dramatically streamlined the process of making the body. We had 6 days to finish the guitar before we had to leave Adelaide to go to Melbourne to showcase our guitar for National Manufacturers week. In that time we had to paint, finish the electronics and cut the Queensland Mahogany to insert into the body of the guitar. SPOILER ALERT… we succeeded. We painted the guitar with a coat of plastic primer followed by a coat of high build primer. After some light sanding we added a base coat of blue metallic paint with a clear coat of lacquer. We were pleased that when we plugged the guitar in for the first time there were no electronics issues with minimum fret buzzing. With some TLC and truss rod / bridge adjustments we were able to fix the fret buzzing and set up the guitar with the right action and intonation tuned to D Standard. These are all processes and things you need to tackle when making a traditional guitar made of timber, so there were no red flags. 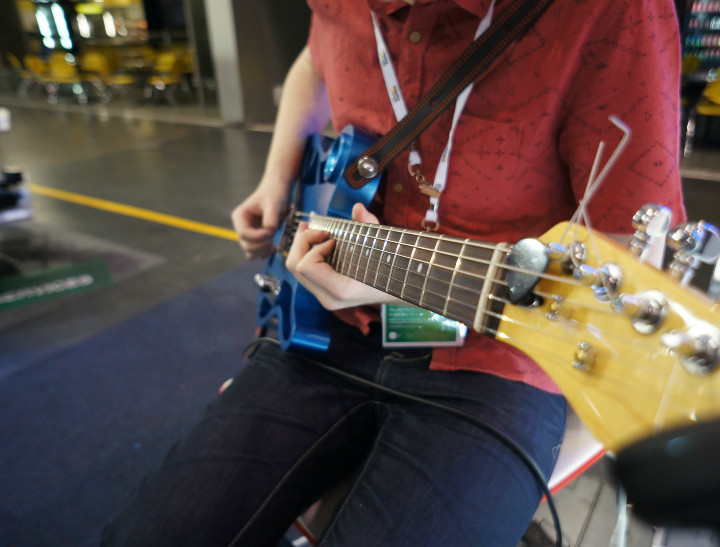 After a stressful week finishing the guitar, we traveled to Melbourne for National Manufacturers week and showcased our 3D Printed Guitar for the first time at the UP 3D Printer Stand! People were amazed and for the first hour some patrons didn’t even notice it was 3D Printed. With Mikes quick ingenuity we managed to make a low budget sign explaining the guitar for those who thought I was a lost busker. Unfortunately we only had one day free to showcase the guitar but it was a great experience and it was great to meet up with some of the key people from BuildTak and Polymaker! The following weekend we had a stand at the Mega Toy Fair, it was a great event and with the help of our distributor we had a competition to give away an UP Mini 3D Printer. 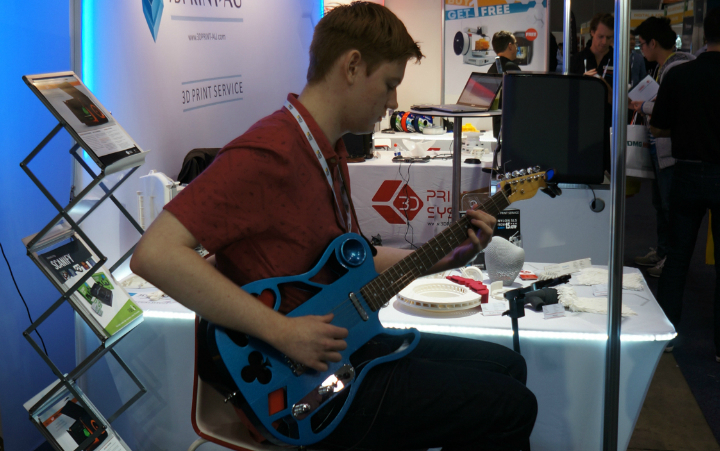 It was great to see so many people take an interest in our Printers and our guitar. Adelaide based photographer Vueey Le was kind enough to help us out and took some really amazing high quality photos of our guitar for us to upload onto our social media pages. We also uploaded a Youtube video showing off how the guitar sounds! A few days later our good friends at PolyMaker wrote a great indepth article on our guitar which spawned some great online attention and discussion including an article from 3ders.org. We were even featured in a 3D Printed electric guitar face off article on 3dprintingindustry.com! It was great seeing this project receive so much attention in Melbourne, Adelaide and online, and it was a great opportunity to get people excited about the possibilities of 3D Printing. If you’re interested in making your own 3D Printed Guitar on the UP Box or on another 3D Printer, you can download the STL files for this print here! For the best results we recommend you print with PolyMax PLA as it is stronger and more durable then ABS and standard PLA. 3D Printing Solutions is pleased to provide the STL Master files for our 3D Printed Guitar. This project has taken the internet by storm and we have had so many requests for the STL Files it was hard to resist sharing them. 3D Printing Solutions 3D Printed Guitar SLT file are for personal use only. The other was a serious tool for real Business and Consumer applications created by formZ PRO and printed on the 3D Up Box Printer. With new materials like the new PC-Plus PolyCarbonate 3D Printing filament products that need to withstand high tensile strength can be made on desktop 3d printers thanks to high tech 3D Filament manufacturers like PolyMaker. We thought it would be fun to design and print a Car Style Scissor Jack for our PolyMaker PC-Plus PolyCarbonate challenge. We designed the Scissor Jack from scratch using FormZ Pro 3D Design Software. The FormZ Pro Software made the task of creating the Nuts and Bolts a breeze and to create the gears that keep the jack stable as it rises we used the FormZ gear making tool which saved a lot of time. We Printed the components using PolyMakers PC-Plus PolyCarbonate filament using Our UP Box 3D Printer. This jack was printed at 0.10mm resolutions using the finest fill settings. We decided produce the entire Jack using 3D printed materials as we did not want the results influenced by materials like steel. All of the jack components were printed with PC-Plus Poly Carbonate with the exception of the white non slip cap which was produced from PolyFlex. The test result was fantastic with the Jack lifting 240kg (almost a quarter tonne). Further more the Jack showed no sign of strain or stress after the lift.